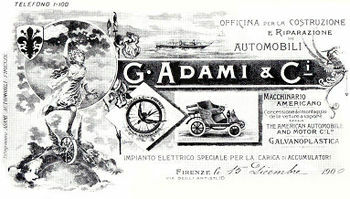 Adami & C was founded by Guido Adami in 1901 in Florence, the car brand Adami was originally associated with a repair shop. Adami started as a race driver and became the 1901 winner of the Italiencups and other numerous races. Adami dedicated himself to the design of engines with great success. The company was founded as a limited partnership in late 1899 by engineer Guido Adami, who was the manager and as general partners had Carlo Ginori, Gerino Gerini, Ernesto Corsini, Antonio Civelli, Antonio della Stufa, Piero Strozzi, Camillo Bondi, Ugobaldo Tonietti and Giorgio Fossi who were practically all the pioneers of motoring in Florence. The company was located in Via degli Artisti 10 where they remained throughout its history. In 1901, the manufacturer decided to become their own and produces a single car model that is presented in Turin Motor Show of 1902. The machine was called the Rondine which had a mounted 16 hp engine developed in house by Adami. The construction of the car was very slow because Adami had many difficulties trying to follow all the technical developments of foreign car makers. Once finished, the car and was awarded the Gold Medal by the Presidency of the Show for the most excellent model. In March 1902 two cars were entered in the Nizza-Abbazia, but the competition was not held due to organizational difficulties. The following year he participated in the Coppa della Consuma where due to unclear reasons failed to reach the finish line. The company ceased operations in 1906. Guy Adami was considered one of the first Italian engineer able to develop a technically sound engine. In the past he was also a talented race driver participating in numerous competitions, among other things, the June 30 1901 won a Padua The Cup of Italy driving a Panhard et Levassor.